the event.....the audience...and yes...the dress! Didn't Madonna say in one of her songs, "Music brings the people together" ? Well I'm not sure she had a recital event like the one I held last week in her mind when she wrote those lyrics but it's so incredibly true, no matter the genre! So some of you have been wondering and waiting about how the whole event went but probably are really in fact more interested in the dress which I'll include a picture of in this post. Did I mention before that the bottom of the skirt is 30 ft around???? :O! Anyways...apologies for the delays. I was in Vancouver for the weekend to rehearse, have a lesson and see my sister and now it's auditions - AH! The concert...recital...whatever you want to call it, was a blast! I wasn't nervous and for the most part I was very satisfied with my performance. A couple of glitches, particularly in my Bach (I guess that's what I get for trying it by memory after already having been playing for 45 minutes) but overall it went very well and there were a lot of appreciative people in attendance! Lots of friends and people I've known for years who have been there for me since the day I started playing were in attendance...my violin teacher of the last 6 years here, my two piano teachers, people from work. It was a really supportive, great audience! Overall too, I must say, a very well behaved one too! There wasn't much coughing that I noticed or crinkling candy wrappers! I really don't know what to write... I was completely on air the whole time. I felt like I had acheived a new level of control in my playing and I didn't find my mind wandering. I was completely in the moment. It's sad in a way though too... I've been so excited for so long about doing this recital and I've put so much work and effort into preparing for it and in a matter of two hours, it was over but at the same time the energy and excitement of doing such a performance glowed on. Is there always going to be this bittersweetness when it comes to doing concerts? I truly am in love with the stage. *sigh* When will I see it again? I hope you all love the dress as much as I do! And a huge thank you to anyone who reads this who was at my concert, it was truly a special and amazing evening for me for so many different reasons and I can't thank you enough for being a part of that. Today is the big day - my recital! It's funny how, as a student, you spend days, weeks and even months preparing for a single concert event, audition or exam yet players who really aren't that much older than me, who are performing professionally already have to prepare many programs and play them all in short succession of one another. I've done that with orchestral programs before but that doesn't seem to have the same level of pressure as a solo recital event. 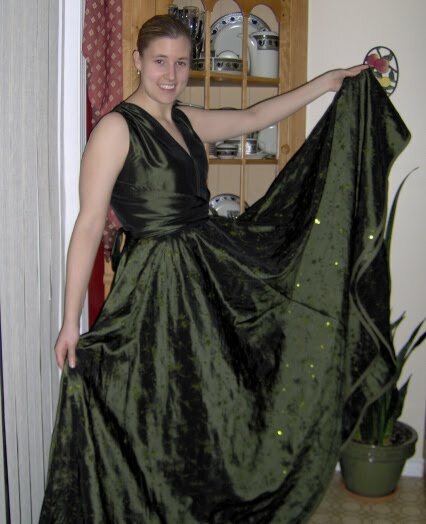 For tonight's recital, my amazing Mom has worked really hard the past few weeks to make me a gorgeous dress that any princess would feel honoured to wear, I'm sure. It will be a really special night tonight as well because my Dad will be at the piano for the majority of the evening. He has accompanied me from right when I was little and first performed on my violin. Another special addition to tonight's program is a piece that my brother composed specially for me and he not only is going to be there tonight to see it but my Dad will take a break from the piano and my brother will be the pianist. Have a stupendous day everyone! I wish I could say that in the last 11 days since I updated my blog that I had done something exciting like jump out of an airplane or gone bungee jumping but if I said that I had done something like that it would all be a fabrication of the facts. I did change all my strings though!!! That should really count for something. It's always a wild adventure trying to get them to stay in tune for the first few days after you put them on and trying to concur that beautiful unplayed quality that they posses when they are new. With excessive scale and vibrato practice I think I am about to the win the battle of "Kelsey vs. Strings" so feel free to adorn me with flowers or chocolate or other free food or you could just send me money! I want to say hello to a couple of special people in my life who read this (I think my blog might even be in their favorites!!!!! I guess I'll have to write something everyday if I want to be graduated and presented with homepage status). Hello to my very beloved Grandparents! I spend a lot of time at their place and especially when I was in school, I spent more time at their house than at my own. They provide me with food and shelter on a regular basis as well wheels (aka a car) so that I don't have to use my feet and lug stuff around. So a very big hello and thank you to you guys! It's going to be weird being away from that come the fall when I go away to school. The other hello is to my sister. She's quite an amazing individual who's defied many odds against her favour and this April, she will graduate with her Bachelor's of Music. There's 6 years between the two of us and like most (or all) siblings we have our moments of altercation but we are still sisters and despite our differences I'm lucky to have her (hopefully she's lucky to have me too.....:). She's a very gifted pianist, incredibly musical and I love watching her play. She's an inspiring individual. So there you have it, another exciting episode of "Kelsey Z's blog". :)!